Gunay is a 40 year old security officer from Enfield who is an extra for films on the side. He lives with his wife, daughter and son who quite often take the mick calling him chubby and telly tubby. He is desperate to lose his ‘moobs’. I think we get that Gunay loves fish and chips don’t we guys and girls? With all the fried food, the second and, sometimes third helpings and no exercise, Gunay’s diet is enough to make a heart surgeon quake in his boots! Gizzi is going to have her work cut out! Then Gizzi asked if it was okay to have a rummage around the cupboards. The first cupboard has a huge stash of crisps and chocolate. Gizzi asked Gunay what he got through a day and he said four or five packets of crisps a day and a couple of bars of chocolate. Gunay, trying to defend himself said that he would have two packets for breakfast and then maybe two later on. Gizzi was lost for words and stood looking at him with her mouth open! There was also an abundance of doughnuts, pastries, custard tarts and gallons of oil! And, of course, the love of his life sat on the side – the deep fat fryer. He described it as his ‘baby’! In his fridge were some feta filo rolls which Gizzi sampled. After being fried, each filo roll contains 3.5grams of fat. Gunay would quite happily eat 10 at a time as a snack! So a massive 35grams of fat in one go – a third of his daily allowance. For Gunay to change his ways, Gizzi was going to have to really pull out all the stops and dig deep in her bag of ingredients! To tackle Gunay’s fried food fixation and knowing that he loves lots of taste, Gizzi decided to try him with . . . an aubergine???? She told him she was going to make him a dip that he could take to work and snack on with a couple of pitta bread. As Gizzi was getting the aubergine ready, Gunay was NOT looking convinced! Gizzi said that normally, the aubergine slices would be saturated with oil to get them cooked. Out came the trusty old oil pump and she spritzed the slices with oil. It meant that only half a teaspoon of oil was used on the aubergines. Gunay still looked doubtful! As Gizzi was making the dip, she got Gunay to smell it – he said it reminded him of Cyprus – could he be softening up to Gizzi’s new dish? Gunay’s Feta Filo Rolls had a massive 835 calories per portion. 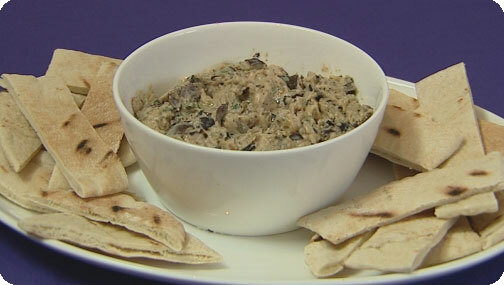 Gizzi’s Smoked Aubergine and Garlic Dip with Pitta has just 248 calories per portion. Gizzi told Gunay to tuck in to the dip. He said he liked aubergine but he’d never had it in this way. He said it was lovely and really tasty. Yay! Gizzi had triumphed! Move It . . . Just a Little Bit! Gunay hasn’t always been on the rotund side though. He has yo-yoed between 12 and 15 stone over the years. He now consumes up to 4000 calories a day – twice as much as he should be having. But, despite this, he does absolutely no exercise! But, as we all know, we don’t need a gym to get some exercise into our lives do we? So Gunay doesn’t have to spend the money or be embarrassed. If Gunay did just 10 minutes of sit ups and press ups in between watching his favourite TV shows every day, he’d soon see some changes on the scales and in his clothes! In just 10 minutes, he could burn off 50 calories and if he kept it up for a year, he could burn off ½ a stone and tone up without setting foot in a gym! The recommended daily fat allowance for a man is 90grams but Gunay was having 270grams just in his breakfast! Over three times the amount he should. The equivalent fat to 25 packets of crisps! What Gizzi had decided to do for Gunay to replace his very fatty brekkie was beans on toast with a poached egg and some bacon. Gizzi also said that she was going to measure the oil out that she needed to cook with. She said it was really easy to just slug a load of oil into the pan but you don’t need a huge amount. A tablespoon is enough – there’s a good tip. Instead of using your normal baked beans from a tin, Gizzi made home made baked beans with the bacon, tomatoes, onion and cannellini beans. This writer’s mouth was watering at the site of that, all simmering away in the pan! Gunay had never had a poached egg before but, if you have a poached egg instead of a fried one, it saves over 30 calories! Yep, another great tip! Gunay tried the dish that Gizzi had created and, even though she had been worried about it at the beginning, Gizzi had come up trumps again. Gunay said he would definitely have it for breakfast! Gunay’s Fried Turkish Breakfast weighs in with a waist busting 270grams of fat! 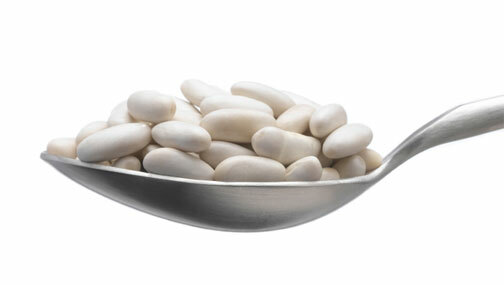 Gizzi’s Baked Beans with Poached Egg on Toast tiptoes delicately in with just 12grams of fat! Gunay would have to eat 20 of Gizzi’s baked bean brekkie to have the same fat content as his normal breakfast! Two down, one to go. The next dish Gizzi needed to transform for Gunay was his all time favourite and British classic, Fish and Chips. Gizzi needs to find something that is a little more calorie conscious. Gizzi showed Gunay a plate of raw veggies and asked him if he recognised what was on there. He got it right with the peppers, onions and courgettes but didn’t recognise the asparagus and the sweet potato. Gizzi said she absolutely loved asparagus and that it rocked! And the sweet potato was going to be used to replace Gunay’s chips. Gunay did look a little sceptical though. Even though the other two dishes Gizzi had done had been spot on for him. This was going to be interesting! Next, Gizzi made the dipping sauce to replace Gunay’s usual tartar sauce. But he still didn’t look convinced. 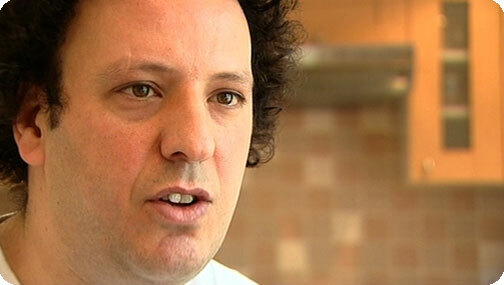 Maybe the sight of his faithful deep fat fryer would instil a bit more faith in Gizzi’s dish? As Gizzi was battering and frying the veggies she had chopped up, Gunay looked very disappointed that there were no chips. He just couldn’t forget about his fish and chips! Once the veggies were cooked, Gizzi placed them all on some kitchen towel to get rid of the excess fat – yep, there’s a great tip! Gunay said he never did that before. When Gizzi was getting the battered prawns out of the fryer, Gunay seemed to be warming up to the new dish because he said it did look nice. And when he tucked in he said it was really nice. He said that the batter was lovely, really light but with a good taste. Gunay’s favourite fish and chips comes in at humungous 2418 calories! 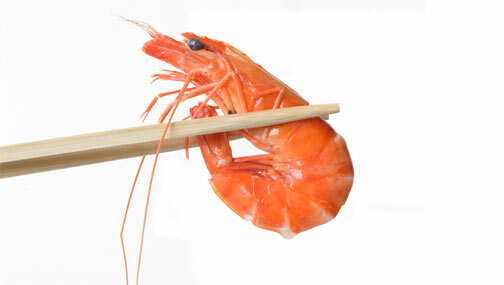 Gizzi’s Prawn Tempura with Sushi Rice and Dipping Sauce comes in at a deLITEful 460 calories. Almost five times less. Gizzi had one final trick up her sleeve for Gunay. To try and keep Gunay away from the love of his life, the deep fat fryer, she gave him his very own griddle pan. If Gunay only swapped the three dishes for the new ones Gizzi has given him and did a little bit of exercise, he could cut his calories by more than 4000 a week! In a year, he could lose up to four stone! Now that IS how you cook yourself thin!